This article is about the card. For the story quest, see Swims-at-Night (quest). Summon: Put a random 0-cost card into your hand. Swims-at-Night is a unique legendary Agility creature card. It is part of the Heroes of Skyrim expansion. In addition to the card's availability in the Heroes of Skyrim expansion, an alternate art version is awarded for completing Chamber of Lorkhan on master mode. "I'm but an honest smuggler." "You're looking at the greatest smuggler in Tamriel." "I can always find a way in." "To the bottom with you!" This card's ability applies the Politics of Contraband card effect. 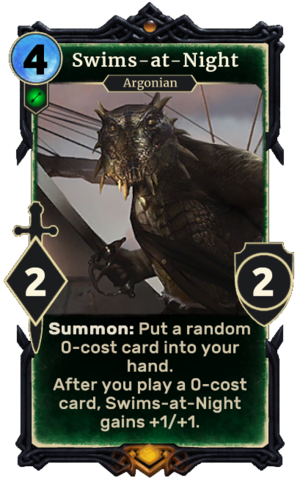 Despite this card's inclusion in the Heroes of Skyrim expansion, Swims-at-Night did not actually appear in Skyrim. Rather, he is a character from The Forgotten Hero story.